I think that Mediterranean-style food has become very popular in recent years. While some places are very authentic, others mix in more American flavors to suit the everyday palette. 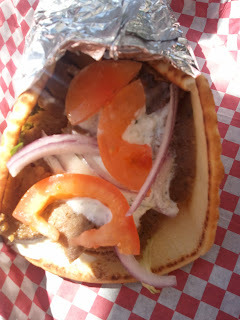 If you're looking for the typical ho hum gyro, this place (although have a great gyro) may not be the place for you. First, let me say the appearance of the Mediterranean Sandwich Co., or MSCo, could be misleading. It's located on Dauphin St in Mobile. It's right in the middle of the bar/club district so the outside is nothing pretty. It's a small place. There's about five round bar tables inside with two to three seats a piece. There's a bar lining one wall with several stools. On sunny days, three tables are set up outside under umbrellas. The hours indicate the kind of customers MSCo attracts. It's opened Monday-Friday 11 a.m. until 2:30 p.m. Then on Thursday - Saturday, the hours include 6 p.m. - 4 a.m. It's definitely the business lunch crowd and then the bar flies kinda place. Today, I convinced two other people to join me at MSCo. My friend, Kat and my brother, Tho. We started with hummus ($3.95) as an appetizer. At first, I thought it was just another hummus but then I took a really good look. The hummus was totally different than any I've had before. The main difference is the color. Instead of that pale yellow or nearly tan color, this hummus look more like a brown mustard yellow. The top of the hummus and the pita slices were also sprinkled with what tasted like cayenne, salt and parsley. After a few slices of pita topped with the hummus, I finally figured out what's the added flavor. It's turmeric; a spice very much like curry. I enjoyed it, but call me a purist.. I like the traditional hummus with a little chili sauce more. Now on to the entrees, I had one of their signature wraps. It was called "the Middle Easterner" ($5.95). Here is the description straight from the menu; rotisserie beef-lamb, hummus, spinach-tomato orzo pasta,and fresh cucumber. I love the texture of this wrap. It's the same full flavored meat used in the gyro but combined with the softness of the orzo pasta and the hummus, it's a real winner. I love all the flavors. 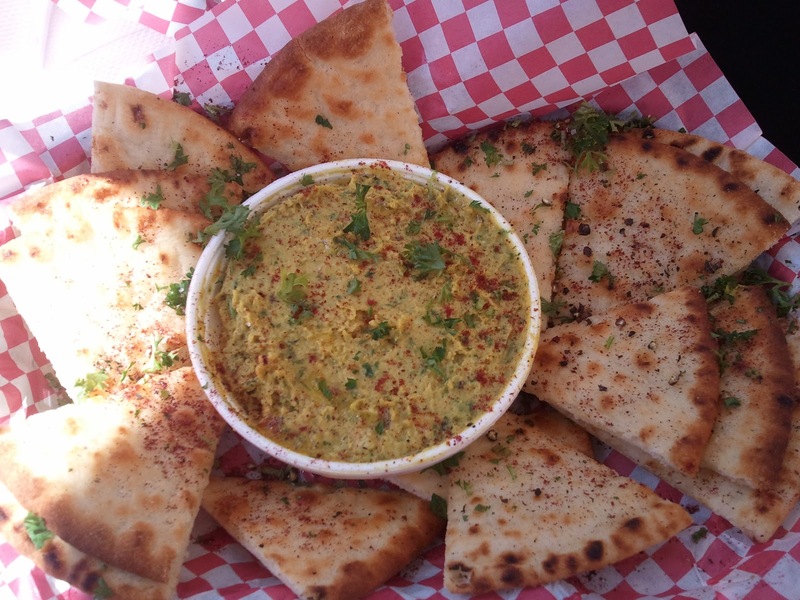 You can taste the turmeric in the hummus, the smoke tomato flavor in the orzo. The cucumber in this wrap is actually an entire cucumber spear, like a pickle. As you eat it, the freshness and crunch of the cucumber gives this wrap character. As a side item I ordered the bacon carbonara orzo pasta ($.99 w/meal and $1.95 regular). The pasta has a very thick, rich sauce. 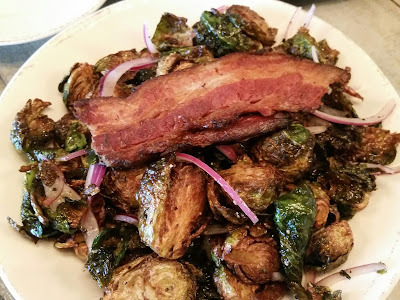 If you're one of those people who likes bacon, this side dish is for you. There's plenty of bacon heaved into this small cup of pasta. However the downside of the dish is sometimes there can be just too much bacon in the dish. The saltiness from the bacon combined with the richness of the sauce can be overwhelming. 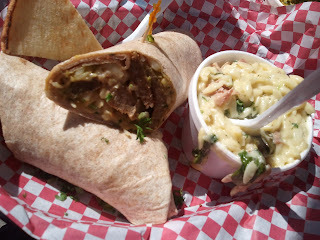 Tho ordered the Jamaican Lamb wrap with vegetable jasmine rice, Mediterranean coleslaw and Caribbean curry sauce. I had a bite and thought it was also very good. The vegetables looked like they were steamed before mixed into the rice. The Mediterrean coleslaw looked like it was cabbage, cucumbers and carrots in a vinegar. rice wine brine. It taste a lot like a Vietnamese style relish. The curry sauce played well with the vinegar in the slaw. Tho also had a baklava ($1.75) for desert. It was a very typical baklava. I remember layers of pastry and filling but this one had a thick layer of filling then lots of layers on top. The entire thing was drenched in honey. For me, it was little too sweet but Tho, who has an incredible sweet tooth, loved it. Now to that gyro. 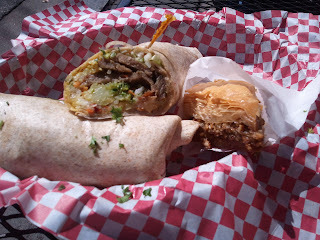 The meat for the gyro provided the base of the two wraps so there's not denying it was good. There's just nothing that particular stands out about the gyro that makes it unique from the dozen other shops offering the same dish. This is not my first visit to MSCo. I have been here another time for lunch and once for dinner. The lunch menu provides much more variety. I remember only the gyro and chicken shawarma on the dinner menu. The dinner is more of a combo since the price includes a side item. My first visit to MSCo. was with two friends. All three of us ordered the Panini-style flatbreads. If I remember correctly, we had the Spartan Panini, the Chicken Fungi and the Samurai Chicken. The description of each is as follows. The spartan panini consist of beef-lamb meat, roasted peppers and onions, pepper jack cheese, thyme horseradish cream sauce. The chicken funghi is rotisserie chicken, fresh spinach, saute mushrooms, gargonzola cheese, mozzarella cheese and pesto mayonnaise. The samurai chicken is roasted chicken, thai chili sauce, cucumber, Mediterrarean coleslaw and black pepper wasabi mayo. We decided to split up our paninis so I was able to taste all three. I really liked all of them, especially the samurai chicken. The thai chili sauce really made that dish along with the coleslaw. Mediterranean Sandwich Co. is definitely one of the places to try if you're in the downtown area. I love that the owners put their efforts into quality food instead of decor. The food is very fresh and they don't cut corners. I tried to get a goat and boursin chesse torte for an appetizer but since they didn't have one of the toppings they refused to serve it. I think that speaks a great deal about their standards. For the complete menu click here. Great review but you forgot one of the most important things...the price of the food!!! Sorry about that,what I meant to say is that when I went to look at their menu there were no prices. I actually have their menu handy. 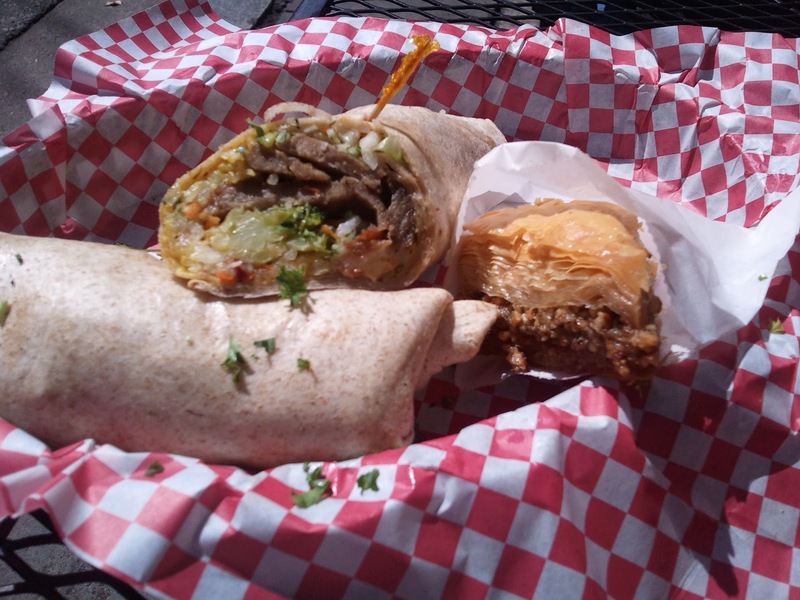 For about $7, you can get a gyro, wrap or panini-style flatbread and a side item. The vegetarian options/appetizers range $4-$6. 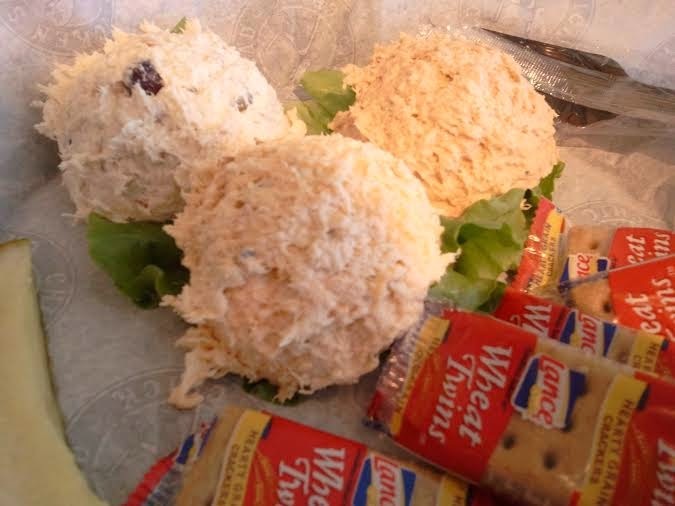 The most expensive item on the menu is the goat and boursin cheese salad at $6.75 without a meat. Adding chicken will cost you $1.75 and Beef-lamb is $1.95. Very affordable prices!